Sorry there wasn't a review yesterday. I wasn't feeling well and needed to skip a day for some extra sleep. Much better now though. 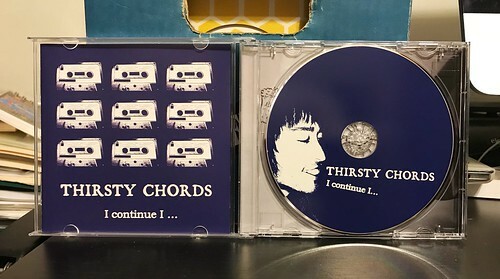 Thirsty Chords is one of these great Japanese punk rock bands that I somehow have been neglecting over the past few years. To think, this record came out all the way back in 2009 and I've just heard of them this year. Shame on me. It was when I was looking up more information about the band Bows that I kept seeing Thirsty Chords mentioned and I figured I should probably check them out. I Continue I... is the band's first album, but they've arrived fully formed and have put together the sort of debut that other bands would kill for. Thirsty Chords are playing the sort of punchy and energetic punk rock that I expect to here from bands like Minority Blues band or others of that persuasion that would call Snuffy Smiles home. The key for me are the strong, melodic vocals that have passion but don't dissolve into unnecessary screaming. The guitar is fast paced and so dynamic it's hard to believe this is a three piece band. Combine that with a drummer that's just killing his kit and piles of catchy hooks and you've got a band that's ticking all the boxes as far as what I'm looking for in punk rock. Unfortunately, I can't find any of the songs from this album online, so you'll kind of have to take my word on how good it is. If you go to YouTube and search for Thirsty Chords, it'll pull up some live footage. I think that will be enough to show you what a great band this is. And the album is even better than those live clips.